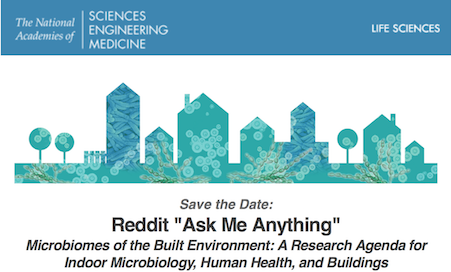 This Friday, March 16th at 1:00pm (EDT), the folks over at the National Academy of Sciences (NAS) will be participating in a reddit AMA (Ask Me Anything) on the Microbiology of the Built Environment. The featured experts are Diane Gold, Vivian Loftness, and Jordan Peccia. All three were committee members on the NAS group that authored the 2017 “Microbiomes of the Built Environment” report. Here’s a NAS flyer for the event… the link on reddit isn’t live yet but will be featured in their science section. Sounds like a great opportunity to get questions answered and see what kinds of questions people have! correction – no “e” on the end of Vivian Loftness’ name. Hey Craig. So the actual link won’t be live until Friday morning so I couldn’t post it. I will try to put it here in the comments once it appears. You should be able to find it on that general page on Friday as well. I believe you need an account on reddit to actually ask questions during the AMA, but anyone can read the discussion as it unfolds.